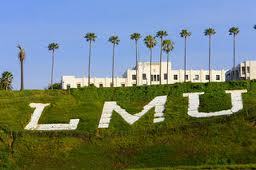 With about 6,000 undergraduate students, LMU is a small- to medium-sized institution founded on Jesuit principles. About half of the students are practicing Catholics. Attendance at mass is not required, but two religion courses are required. My tour guide, a Junior biomedical engineering student from Singapore, told my tour that LMU students are ‘big on service’ and gave examples of weekly community service activities. About 25% of the students are involved in Greek fraternities and sororities. Both the film and business programs are highly acclaimed. LMU has a top 20 engineering Ph.D. program, as well as a ‘4+1’ program in which students earn a Bachelor’s degree in 4 years and a Master’s Degree after an additional year. Tour guides will also note that only professors – not TAs – teach the science classes. The student-to-faculty ratio is 11:1. LMU has an impressive section of the Berlin Wall on its campus, surrounded by spacious quads and mission-style architecture. About half of the upperclassmen live on campus, in apartments with a beautiful view of the Pacific Ocean. A state-of-the-art gym, with regular yoga and aerobics classes, are all included in the tuition. Students currently enjoy free valet parking on campus (although the school has recently announced they will soon implement a fee), as well as free massages on Tuesdays.